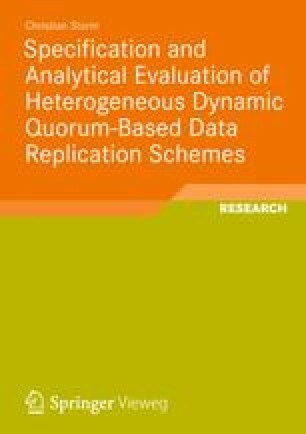 The choice of a data replication scheme – and thus a particular quality measure trade-off – needs to be carefully drawn and evaluated as it is crucial to the resulting quality of the distributed system. Evaluation methods based on simulation are no good candidates because of their massive time complexity or, if run in an acceptable amount of time, their approximate nature of results. Contrarily, methods based on stochastic analysis are fast and accurate but demand for a carefully chosen higher level of abstraction in the system model: An analytical model which is as detailed as a simulation model is in general not tractable due to exponential time and space requirements. On the other hand, a higher abstraction bears the risk of oversimplification. Therefore, the analytical system model must be as precise as necessary and as abstract as possible for it to provide meaningful results and to be tractable at all.